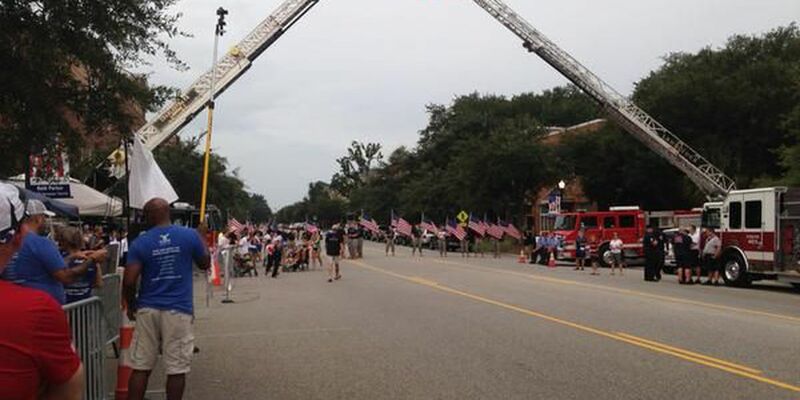 DANIEL ISLAND, SC (WCSC) - People came together Saturday on Daniel Island for the nationwide 9/11 Heroes Run. The run recognizes the service and sacrifices made by military and first responders on a daily basis. The 5K started and ended at the Charleston Fire and Police Department. "It's just a shirt that's honoring my grandpa," says Anthony Meredith as he looks down at his shirt. Meredith was named after his grandpa, a firefighter who passed away on 9/11. Today his family is honoring the military and first responders with the community. "This event touches my heart because there's so many supporters out there for our fallen comrades, those who helped out our country in 9/11," says Veteran Gena Corbin. Corbin says she joined the service right before 9/11. Event organizers say the run is a time set aside to remember those who lost their lives and those that are still serving. The youngest Medal of Honor recipient, Corporal Kyle Carpenter was recognized during the opening ceremony. He was presented with a banner that will be displayed on Daniel Island. "I've been in the military 13 years so I lost a few good friends dealing with the war on terror and 9/11 is very important for me," says Ransom Holland who served in the Air Force and is now with the Army National Guard. "I remember when it happened and I've been motivated ever since." James Boudreau is with the Army National Guard, too. "Being in the military for the past 10 years, this has always struck a chord, it's very important just to remember the lives that were lost," says Boudreau. The 9/11 Heroes run gives back to local responders and military organizations. Jack Blackmon is the President of the Tri-County Fraternal Order of Police, a local charity partner with the race. "They provide us with some financial funding to continue our mission of supporting local enforcement in times of need and distress," says Blackmon. The community support means a lot to those who serve and their families. "Sometimes you feel as though first responders and the military doesn't get enough backing," says Holland. "Then you see this and you know American people are... behind everyone." The 9/11 Heroes Run is hosted by the national Travis Manion Foundation. The Charleston run has given back nearly $25,000 to local military and first responder organizations since the first race in 2012.